Experiential learning is the process by which a participant creates meaning from focused reflection based upon a direct experience. It is a necessary part but not the sole component of experiential education. Though many use the terms interchangeably, experiential learning refers to the process that a learner undergoes, where as experiential education refers to the transformational development between educator and perfomer and the larger social context of that educational process. 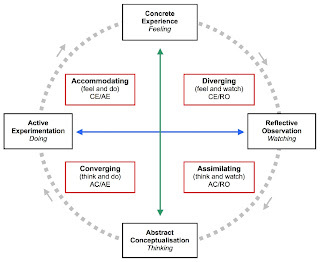 The underlying premise of experiential learning explores the cyclical pattern of all learning from experience through reflection and conceptualising to action and on to further experience. A leading exponent on the subject of experiential learning theory (ELT) is David A. Kolb who is also renowned in educational circles for his Learning-Style Inventory (LSI). His seminal work entitled 'Experiential Learning: Experience as the Source of Learning and Development' published in 1984 has influenced academics, teachers, coaches and trainers ever since by introducing fundamental concepts about human learning behaviour. Kolb attributes his work to the likes of John Dewey, Jean Piaget, Kurt Lewin, Roger Fry, and others writers of the experiential learning paradigm. David Kolb's theory sets out four distinct learning styles (or preferences), which are based on a four-stage learning cycle. In this respect Kolb's model is particularly elegant, since it offers both a way to understand individual people's different learning styles, and also an explanation of a spiralling cycle of experiential learning that applies to us all. 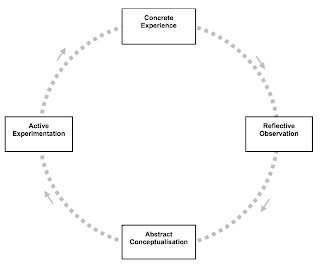 He includes this 'cycle of learning' as a central principle of ELT in which 'immediate or concrete experiences' provide a basis for 'observations and reflections'. These 'observations and reflections' are assimilated and distilled into 'abstract concepts' producing new implications for action which can be 'actively tested' in turn creating new experiences. 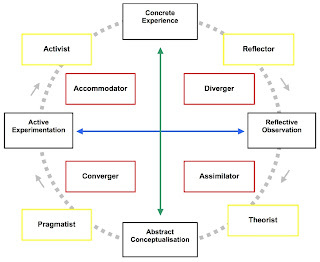 His LSI model is built upon the idea that learning preferences can be described using two lines of axis (continuums): 1) Processing Continuum which connects active experimentation (AE) with reflective observation (RO) and represents our approach to a task (preferring to do or watch) and 2) Perception Continuum linking abstract conceptualisation (AC) with concrete experience (CE) and reflects our emotional response to the situation(preferring to think or feel). This results in four types of learners: accommodator (CE-AE), converger (AC-AE), assimilator (AC-RO), and diverger (CE-RO). Explanations of these learning types can be downloaded here in Word format. In summary, here are brief descriptions of Honey & Mumford's four key styles and their mutually corresponding relationship within Kolb's model in which the learning styles are a product of combinations of the learning cycle stages. 'Having an Experience' (CE), and Activists (style 1): 'here and now', gregarious, seek challenge and immediate experience, open-minded, bored with implementation. 'Reviewing the Experience' (RO) and Reflectors (style 2): 'stand back', gather data, ponder and analyse, delay reaching conclusions, listen before speaking, thoughtful. 'Concluding from the Experience' (AC) and Theorists (style 3): think things through in logical steps, assimilate disparate facts into coherent theories, rationally objective, reject subjectivity and flippancy. 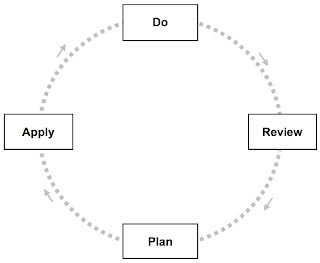 'Planning the next steps' (AE) and Pragmatists (style 4): seek and try out new ideas, practical, down-to-earth, enjoy problem solving and decision-making quickly, bored with long discussions. I hope it's ok with you, but I just linked this particular blog posting to my blog. I'm in the process of going through various theories and models related to experiential learning, and since you did such a good job with Kolb's Experiential Learning Theory, I thought it best to simply link it. If you have any problems with this, just let me know and I'll take it off.